[L]ast summer, while doing research for this special issue dedicated to Acadia National Park, I joined a group of photographers on one of our Down East Adventures as they set out for Cadillac Mountain in the early morning darkness. It was something I’d never done, and I felt it was well overdue, a prerequisite for my day job. You don’t expect a traffic jam on a mountain in Maine before 5 a.m., but that’s exactly what you get in August when summiting Cadillac to witness the sunrise. 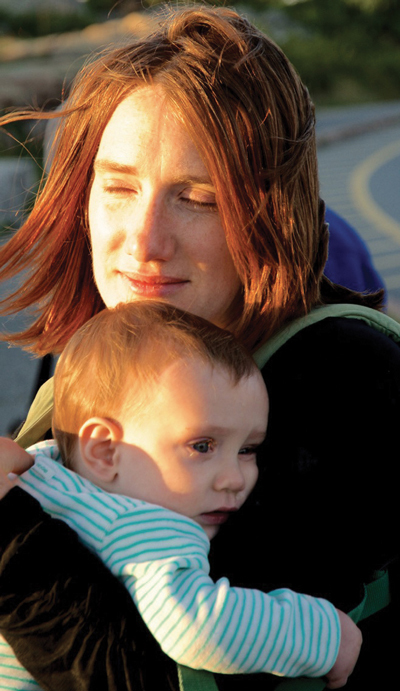 With my then 9-month-old son snuggly wrapped, we joined the steady line of headlights snaking up the road. Some 20 minutes later, we arrived at the top and stepped out into the chilly air. I’ve never been on a holy pilgrimage, but I imagine the experience is something like what I saw that morning. Throngs of people moved across the parking lot and scaled the rocks on the eastern side of the peak, assuring their position for the fleeting spectacle to come. Noise is something I didn’t expect either — for me, the notion of a mountaintop before sunrise evoked images of solitude and quiet. That morning, though, the mountaintop buzzed with chatter, like a theater before the lights go down. But once the first sliver of sunlight appeared, silence fell swiftly as the crowd centered its focus on the horizon. All eyes looked outward. The sun rose over the ocean, and rays of light washed over Cadillac’s bald peak, casting the faces of the crowd in a pink and orange glow. My baby opened his eyes and looked up at me, his own personal sun, and I felt in my bones the transformative power of this sacred place. 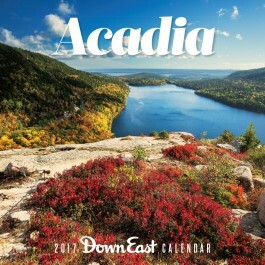 In your hands is our celebration of Acadia as it observes its centennial anniversary. We honor both the natural and cultural aspects of our treasured national park. Rather than a comprehensive guide, this issue is a leisurely stroll through the various identities of this place and its people. I recommend reading it any way you like — front to back, back to front, skimming around. You’ll find familiar sights and new discoveries — not unlike a trip to the park itself. We love Acadia: its hiking paths and carriage roads, its sun-warmed ledges and rhythmic waves. We even get a kick out of its summer crowds — without them, after all, downtown Bar Harbor wouldn’t be the crazy, noisy, joyful festival that it is. One hundred years ago this summer, President Woodrow Wilson established Sieur de Monts National Monument on Mount Desert Island, which would evolve by 1929 into Acadia National Park. It was the first national park established east of the Mississippi, a different beast than the sprawling wilderness parks of the West. In fact, if we had to pick one reason we love Acadia, it would be the way it’s woven into Maine’s cultural fabric, so intertwined with its neighboring fishing villages and resort towns that it’s sometimes hard to tell where one ends and the other begins. Fortunately, we’re not limited to one reason. 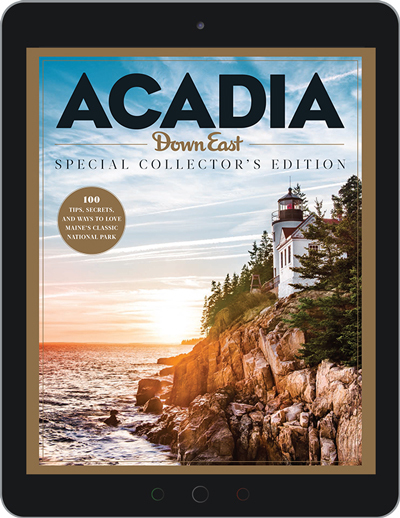 In this issue, we present our hundred-item celebration — as rich and varied as Acadia itself — of the park we’re proud to call Maine’s own. It took a starry-eyed aristocrat to transform exclusive MDI into a shared national treasure. The relationship between the Wabanaki and the lands we call Acadia is millennia-old, complex, and ongoing. One writer’s earliest childhood memory: fleeing the blaze that forever changed Bar Harbor. One author’s obsession with Acadia’s unnoticed memorials and clandestine trails. A (slightly cringe-inducing) excerpt from a 2013 National Park Service report on the history of Isle au Haut.